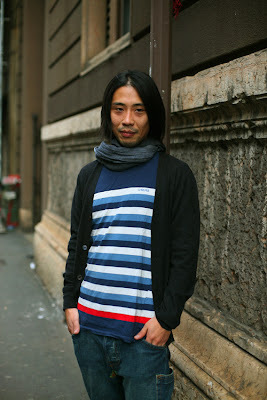 Comments on "On The Street.........Striped, Milan"
Love his look! Great t-shirt! I have heard that the Japanese say that we Europeans plus Americans look all alike.I also think that all the Asians look alike-on the general level.This guy tries to step out from the mass with a colorful outfit,and manages it quite well. Outside of the single red stripe, I don't see anything particularly particular about this, I'm afraid. I so want to buy a striped sweater but if I buy one now, i am afraid to be a season behind!!! Would it be ok if I sport a striped sweater now, or is the fad going to be gone in a matter of month/s???? Just in case no one else mentioned the great orange stripe, I will. What a great orange stripe! The guy isn't bad, either! I love his hair. And that one red stripe. to anonymous above: I think the tshirt is by the british brand Silas. not sure that i understand what is good here. Cool jeans, cool cardigan, cool tee, worn just right. It looks easy, but it's not. Are you serious? You are saying that a quirky outfit is the only way to make a Japanese man stand out from the otherwise nameless sea of Asians? I wonder if you even realize how blatantly ignorant that is. And you justify it by stating that you "have heard the Japanese say that we Europeans plus Americans look all alike". Probably only a few Japanese individuals, if that, have told you that all white people look alike. Yet you attribute that comment to "the Japanese". What if this man had been black? Would you have had the guts to say that all black people look the same and that black people think white people look the same? Probably not. It's a little bit of a touchy issue, given that blacks have been treated like dirt for a majority of America's history and are still struggling to gain equality. Yet because there has been less of a history of abuse of Asians in this country (although there was a period of Japanese internment), we feel that it's O.K. to lump them all into one group, make them out to be one person, a flimsy stereotype. But this "them and us" mentality is no joke. It leads to feelings of superiority and, eventually, mass abuse of a certain race. So Anon 3:29, please think before you make another mindless generalization about an extraordinarily diverse group of people. I forgot the scarf! Worn just right too. The guy's ON. When the weather is in flux, I like to wear long cotton scarves like he's got here, but they're not always easy to find. I've had some luck with a Fair Trade nonprofit that makes their clothes in India. Their clothes are a bit new age, but it's a great source for the scarves & home interior fabrics. They're a wonderful company. I think he managed to pull off the casual yet stylish concept quite well. He looks well put together, and neatly done. A handsome fellow, dressed down with panache! Ooh I love that red stripe at the bottom of his shirt, cleary designed to be worn outside the trousers. His aura says moody but hot with just the right amount of sass. I love it, especially that one red stripe.